It has been an interesting week; firstly I was thrilled that on Thursday afternoon I was finally able to charge my FitBit, meaning I was able to start tracking my steps, et cetera. That may not seem relevant to you, but on a weekend when I can either go walk around and be a tourist, or I can stay in my hotel and watch movies, when there is incentive to get that 20,000 step day can be the difference (and it was on Saturday). I am staying in an area of Tokyo called Shinagawa Seaside. It is a very nice area – not downtown, but there are still a lot of businesses around here – the office towers of Rakuten where I am working are both within a block of the hotel, and Microsoft Japan is a ten minute taxi ride away. I am getting to know the area very well, because even when I am not out and about exploring Tokyo, I am walking around Shinagawa every day or evening. I found out the other day that Shinagawa is built on reclaimed land, which means that by all rights there should be plankton here and not offices. Nevertheless here we are. 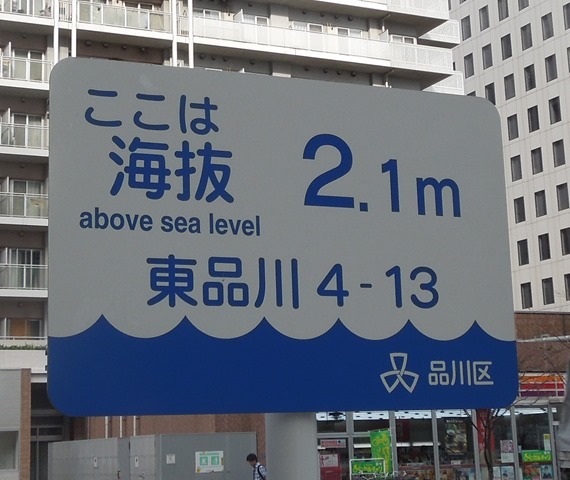 However there are several signs within a few blocks that point out our elevation – I have seen them ranging from 1.8m above sea level (right outside my hotel) to 2.8m above sea level (about three km by foot from the hotel). In a land recently hit by typhoons, tsunamis, monsoons, and earthquakes this is a bit unsettling to be sure, but I assume that if nobody else is particularly frightened by it then I can live with it too. The 2.1m picture to the right of this paragraph is just outside the office tower where I am working. 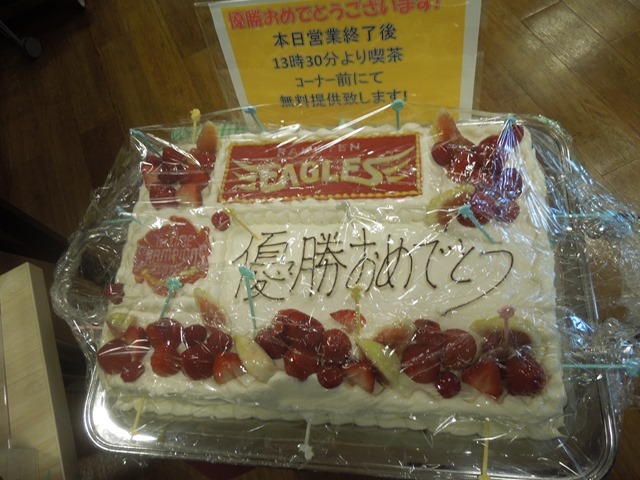 I think I mentioned in a recent post that the Rakuten Eagles, the baseball team owned by the company where I am working, won their first pennant ever last week. The lobby of Rakuten Tower 1 has been completely filled with flowers since, and one day last week there was a celebratory meal in the cafeteria – complete with a very nicely decorated cake. I am glad that I was able to take a picture before everyone dug in, because I ended up getting the last piece of the last cake that the had. I should have asked how many cakes they actually baked so that all 12,000 employees could have a piece. I will tell you this… victory tastes good! Saturday I opened my tourist book and decided to take the train to Akasuka, an area that is not only bustling with commercial activity (spoiler alert: the entire city is like that) but also has some amazing sights to see. 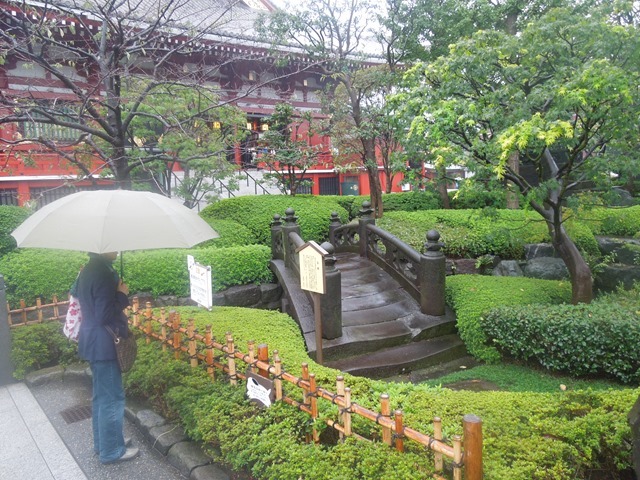 The Sensoji Temple is said to have been built in 628. 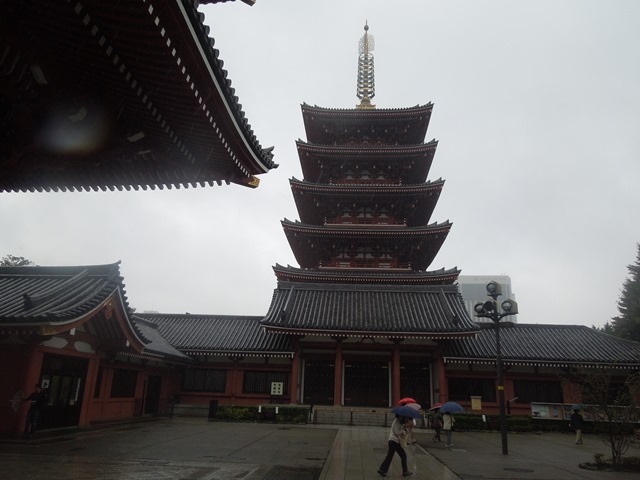 It was a rainy day, but it didn’t matter… I had an umbrella, and I walked the five minutes from Akasuka Station to the holy site. It’s funny, but when you are in a strange land where you can’t understand a word that anyone is saying it is even easier to pick up familiar tones. Just outside of the train station I did a double-take when I heard an older couple (Reuven and Eilat) speaking Hebrew. I introduced myself and they invited me to join them. 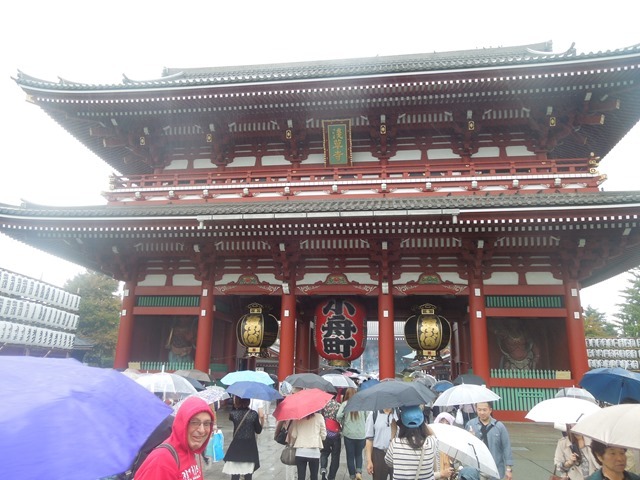 We walked through the throngs of people carrying umbrellas toward the temple. While it was great to be able to speak to people in a familiar language for a while, their idea of interesting and mine did not seem to connect. They wanted to see the temple, but as soon as they saw it they wanted to leave and head to the next subway station to see something else. I understand, because they are in country for a few days and want to see as much as they can. I, on the other hand, will be spending a lot of time here over the next few months, and I wanted to look around the grounds, which it turns out are amazing. There is a Five Story Pagoda, and the gardens are magnificent. I am glad that I came back and strolled around after splitting with the Israelis… there was just too much to see to only spend five minutes in the temple and then turn around and go home. Below is a picture of the ancient bridge, with signs asking people not to feed the carp (which are huge). I finally stopped for lunch, but that mission was a failure. As I was alone I was told to sit at the counter with my back to the room… not my favorite position my wife will attest. Before I could even order I was actually hit (hard!) on my back… although not with any malicious intent. An older gentleman did not realize there was a step, and he swung his arm trying to break his fall. Look, I know he didn’t mean anything by it, but that doesn’t change the fact that it hurt! I decided that it was a bad omen and removed myself from that restaurant. I ended up eating a bowl of fish and chicken soup with noodles with a side order of gyozo (dumplings). The soup wasn’t great… the dumplings were good. What was spectacular though was the dessert that I had at a market stand a few blocks away… If you have ever had the sesame balls in a Chinese restaurant, imagine those, but not fried, and wonderfully prepared… for about the equivalent of $.80 it was like a taste of heaven… and I am glad that I had the willpower to stop at one! There is so much more to tell, but I will save it for another day – tomorrow, don’t worry! Thanks for reading! Japan is beautiful, and it is one of the places to which I’d love to go; I’d give anything to go there; from the language, to the culture, to the kindliness of the people, to their accents. Just beautiful all around. Have a good time, and try to get a glimpse of His Imperial majesty!